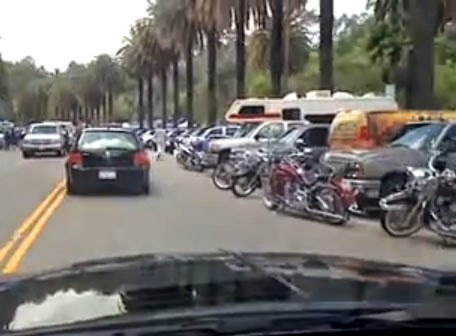 I don't think anyone should be surprised there will be some new parking/tailgating related restrictions put into place for Opening Day near Dodger Stadium this year. 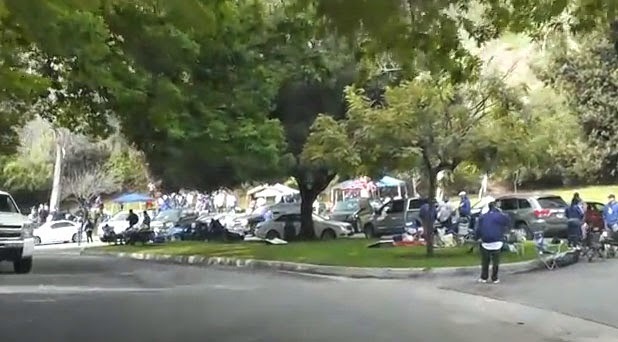 As you know, tailgating at Dodger Stadium is restricted, so fans head to adjacent Elysian Park to party before games. This usually isn't a big deal for most games, but on Opening Day it can be a nightmare. The place gets flooded with fans, and as a result the revelry can become a nuisance. For those who live nearby (namely the neighborhoods near Scott and Morton Avenue in Echo Park) it is an undesired disruption. From what I understand, there was a huge party in neighborhoods near Dodger Stadium last year. Folks partied all morning and afternoon, drank alcohol and urinated in front of people's homes and in the streets, and there was an impromptu parade on Scott Avenue. Needless to say, it was a madhouse. As a result, there will be "No Parking" signs along a stretch of Stadium Way known as "Avenue of the Palms." Also, several streets will have two-hour parking restrictions that both tailgaters and residents will have to abide by. So far, only four different thoroughfares have the two-hour restriction, but I suspect every residential street in the area will eventually face the parking limit. The map at the very top shows the currently announced parking restrictions. More details will be announced later this week that will likely include more streets. BTW, these restrictions will only exist for Opening Day. 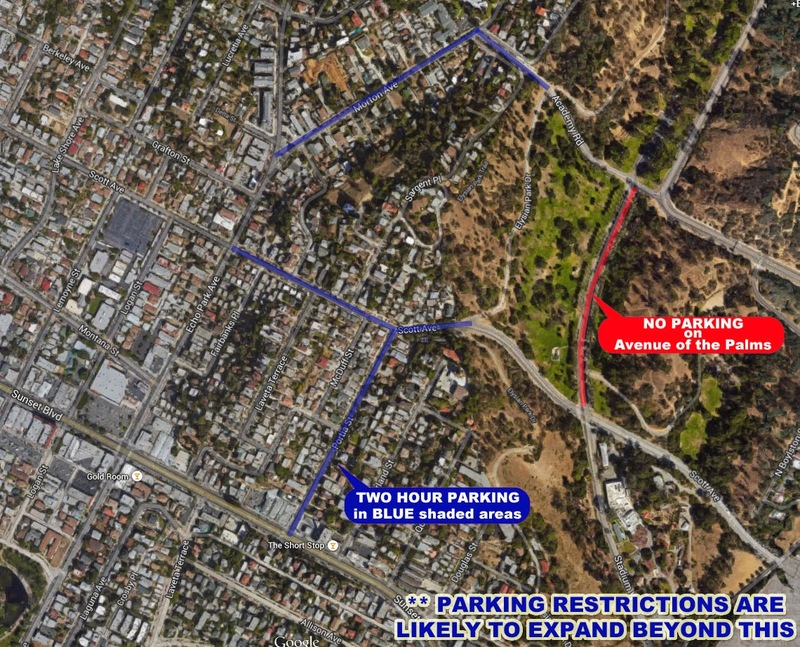 ***UPDATE on the restrictions; including the expansion of the 2-hour parking areas, can be found here. Larry Sherry had a pretty good rookie year in 1959. He joined the club in July and had some marginal success as a staring pitcher; going 1-2 with a 3.62 ERA in five starts. It was as a reliever, though, where he really excelled on the mound. In 14 relief appearances that season, Sherry won five games and recorded a 0.74 ERA with three saves and 26 strike outs in 36.1 innings. But that's not all. Larry Sherry had an even better postseason. Against the Chicago White Sox, Sherry finished all four Dodger victories. He recording two wins, two saves and a 0.71 ERA, and was awarded the World Series MVP by the press. 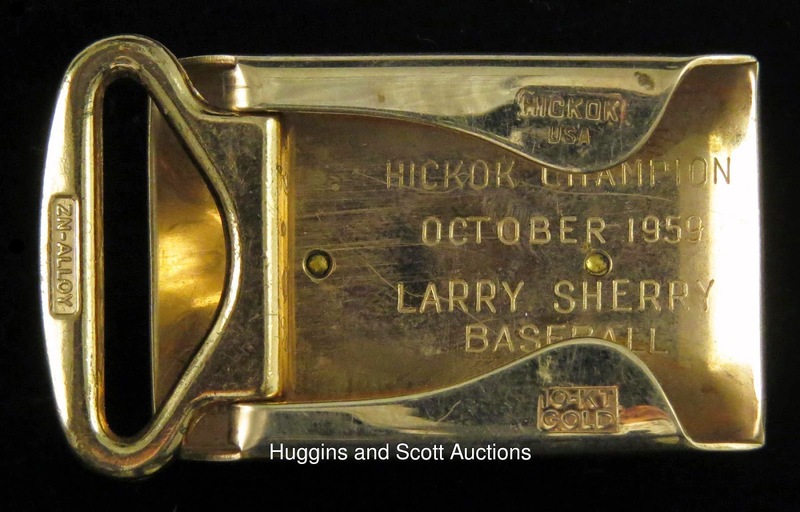 Furthermore, he also won the October 1959 Hickok Championship Belt Buckle given to the best athlete in any sport for that month, and you can see photos of it in this post. 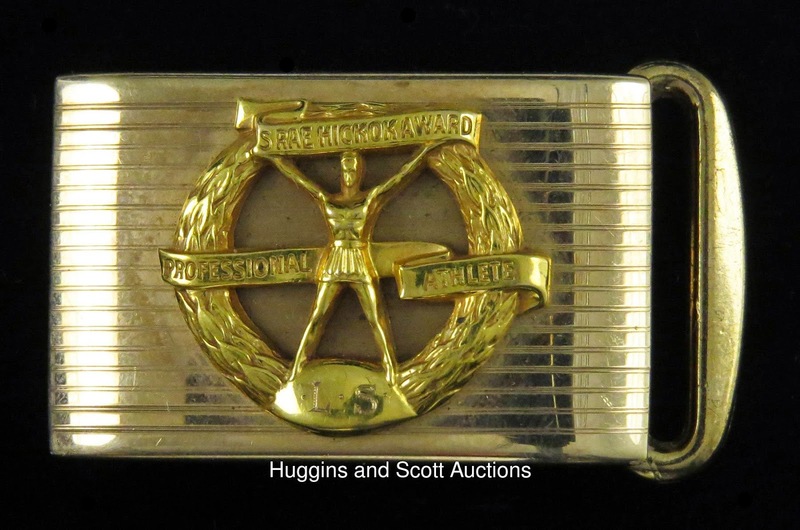 It is currently for sale at Huggins & Scott Auction. Check it out here. BTW, this isn't the first time I've mentioned this award. Last year I shared a vintage press photo that I had added to my collection featuring Sandy Koufax winning a similar award. He had won the S. Rae Hickok Professional Athlete of the Year Award (Hickok Belt) in 1963. The Sherry award is only for his exploits during a single month in 1959. You can check out that old post here. RIGHT IN THEIR BACKYARD: The Dodgers, who have the National League’s best spring winning percentage at .652, will take on the Arizona Diamondbacks for the second and final time this spring this afternoon. Last year, the Dodgers dominated the Snakes, winning 15 of 19 games, including two in Sydney, Australia, and eight of 10 in Phoenix. This season, the clubs will square off during the campaign’s first month as the Dodgers travel to Chase Field for their first road trip, April 10-12. Arizona’s first visit to Dodger Stadium will come the next time the squads play, from May 1-3. NOT HALF BAD: The Dodgers split a pair of contests yesterday in their final split squad of the Cactus League campaign. At Camelback Ranch, Los Angeles downed the Rangers, 10-5, behind three hits, three RBI and a homer from Buck Britton, and finished the spring season 3-0-1 against Texas. 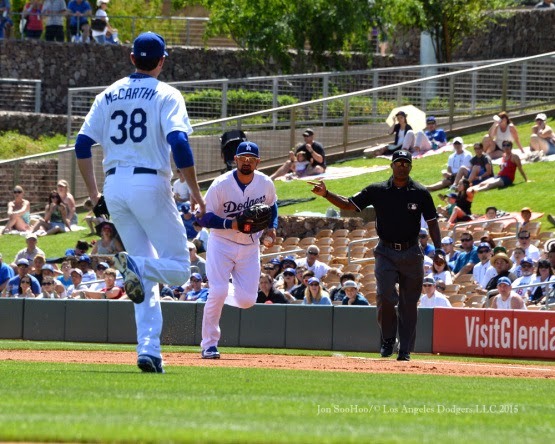 Jimmy Rollins, Howie Kendrick and Scott Van Slyke had two hits apiece for the Dodgers who collected 15 on the afternoon in support of starter Brandon McCarthy, who gave up three runs in 5.2 innings. Over in Scottsdale, the “other” Dodgers lost to the Giants, 11-9. In that contest, Joc Pederson went 2-for-3 and belted his sixth Cactus League homer while Yasiel Puig went 2-for-3 with a double, run and RBI. Catcher Yasmani Grandal was 2-for-4 with two doubles and Kiké Hernandez cracked his fifth homer, a three-run shot in the eighth inning. Dodger starter Carlos Frias allowed three runs and eight hits in 3.1 innings. FOLLOW THE LEADERS: The Dodgers have blasted a Major League-leading 45 home runs (four more than the Cubs’ 41) and have a .289 team batting average (3rd, NL) with a .495 slugging percentage (2nd, NL) this spring. Joc Pederson continues to rank among the NL leaders this spring in batting average (.389, 3rd), slugging percentage (.796, 1st), hits (21, 2nd), runs (13, T-2nd), total bases (43, 2nd) and home runs (6, 2nd). Justin Turner has hit safely in 14 of his last 15 games and is batting .465 with six doubles, three homers and eight RBI, while posting a .489 on-base percentage and a .814 slugging percentage in 17 Cactus League games. Turner’s 20 hits this spring tie for third-most in the NL and his 35 total bases are tied for fourth. Yasiel Puig ranks among the NL’s best this spring in home runs (5, T-3rd) and RBI (13, T-5th); Kiké Hernandez places among the league’s best in home runs (5, T-3rd) and runs scored (12, T-4th); and Howie Kendrick is tied for fourth with 12 runs scored. FOLLOW ME TO BRADLEY! : The official dedication of the Charley Steiner School of Sports Communication at Bradley University will be held tomorrow, March 31, at 3:00 p.m. at the Caterpillar Global Communications Center in Peoria, IL. The dedication program will include remarks from Dr. Jeff Huberman, Dean of the Slane College of Communications and Fine Arts; Dr. Paul Gullifor, Chair of the Department of Communication; Joanne Glasser, President of Bradley University; Jim Ardis, Mayor of Peoria; and of course, Charley himself. Video of the dedication will be available following the event at bradley.edu/steinerdedication. The Steiner School will have 120 majors, in radio and television broadcasting, journalism, production, direction, ethics, media relations, digital and sales. ON THE MOUND: LHP Brett Anderson will make his fourth Cactus League start today. Anderson has allowed three runs on 10 hits through 6.2 innings so far this spring. He last pitched in a Cactus League game on March 19 against the Angels, allowing three runs on seven hits through 1.2 innings. The southpaw did pitch in a minor league game last Tuesday, on the Dodgers’ off day. In that contest, he allowed three runs and nine hits in 5.2 innings. Anderson tossed 79 pitches and struck out five in that outing. LHP Paco Rodriguez is expected to make his ninth appearance of the spring today. Through eight Cactus League appearances, Rodriguez has tossed 8.1 scoreless innings, surrendering only three hits and striking out 10. LHP Adam Liberatore is also expected to see action today. Liberatore has held opposing hitters to a .148 batting average this spring, allowing only four hits in 8.0 innings of work. RHP Yimi Garcia will make his ninth Cactus League appearance today. Garcia allowed his first run of the spring in his last start on Friday against the Giants. RHP Pedro Baez will also make his ninth appearance of the spring today. Through eight Cactus League appearances, Baez has allowed five runs on seven hits in 8.0 innings. Veteran RHP Mike Adams is expected to make an appearance today. Through 3.2 innings this spring, Adams has surrendered four hits and three runs while striking out four. Something tells me that the old guy still got it! 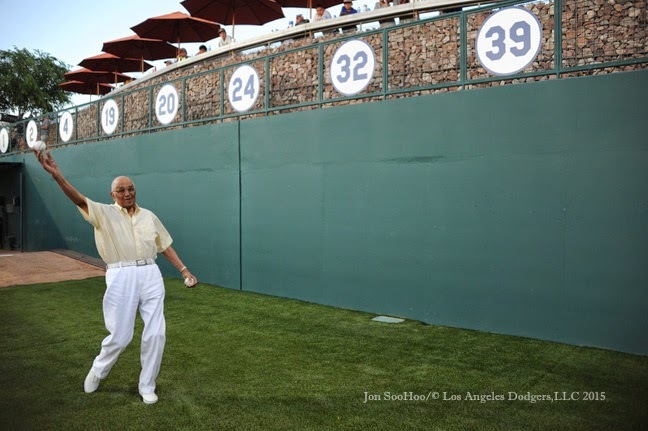 Don Newcombe threw out the first pitch before this past Friday's game at Camelback Ranch. Steve Yeager caught the pitch to the rousing applause from the fans in attendance. 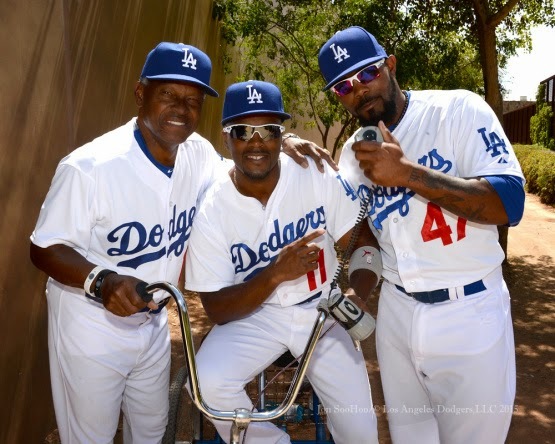 The photo above via Jon SooHoo/LA Dodgers 2015. Go here to check out more pics from the evening from Jon here. Via JP Hoornstra at Inland Valley Daily Bulletin, "Vin Scully is still a baseball fan as he begins 66th season with Dodgers." GCRL (GarveyCeyRussellLopes) Blog tells us a bit about the last time the Dodgers wore a black armband and created some fantastic fantasy cards in commemoration. It was in honor of the wife of Ken McMullen who had passed away of breast cancer at the age of 30. Check out the post here. Via Ron Cervenka at Think Blue LA, "Bullpen decisions ‘toughest ones’ for Mattingly." 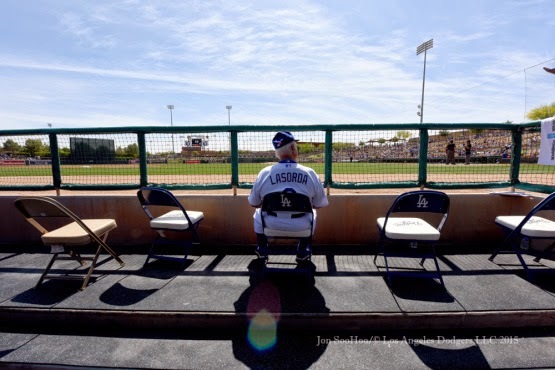 Via Jared Massey at Dodgers Nation, "Dodgers 2015 Top Prospects: Beginning The Countdown From No. 50."